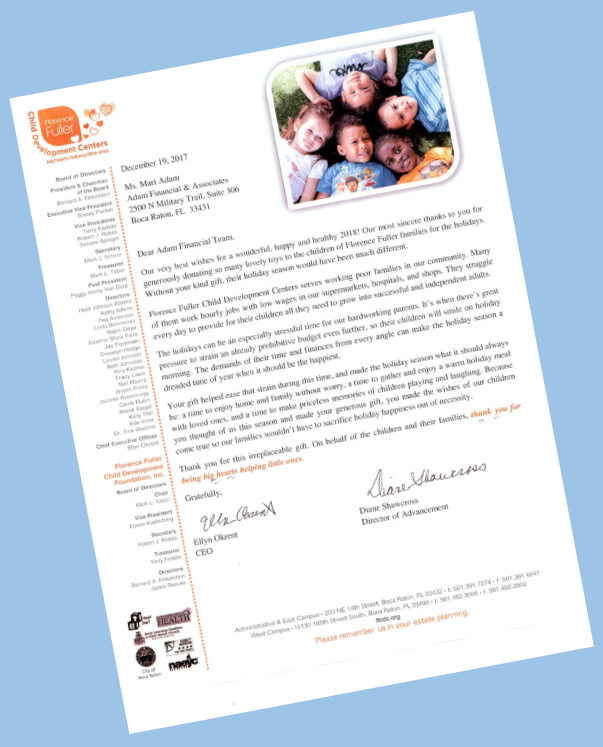 We wanted to share the wonderful letter we received from the Florence Fuller Child Development Centers saying a big “thank you” for all the holiday toys! Those gifts were donated by all our generous clients and friends and dropped off at our Holiday Party in December. (Some clients also made very thoughtful cash donations to support the organization). Florence Fuller Child Development Centers provides quality childcare, early education and family support programs for children from economically challenged families in our area. Thank you again to all the “elves” who helped make this a happier holiday season for the children! For more information on how you can help local children, please visit Florence Fuller Child Development Centers online. Missed our Holiday Party? We had lots of fun and collected all these toys in the photo for local children! ← He’s Only 20 Years Old: Meet Florida’s New $450 Million MegaMillions Winner!